Dr. Rima Bahous, director of LAU's Center for Program and Learning Assessment, gives opening remarks at the second regional conference on "Program and Learning Assessment in Higher Education," October 29–30. Around 40 educators from institutions throughout Lebanon, as well as from Jordan, Morocco, Saudi Arabia and Qatar, took part in the event. Over 20 presentations were given by the different participants on a wide range of topics that included general assessment tips and issues relevant to specific disciplines. Click on any photo above to view all three images. The second regional conference on “Program and Learning Assessment in Higher Education” gathered around 40 educators from institutions throughout Lebanon and four other Arab countries at LAU Beirut from October 29-30 to share their expertise in the field. During the two-day event, over 20 presentations were given by the different participants on a wide range of topics that included general assessment tips as well as issues relevant to specific disciplines. The conference’s main themes included assessment of professional schools’ programs, general education learning outcomes and assessment, classroom assessment in higher education, assessment of learning outcomes across the disciplines, and universities’ efforts toward accreditation. 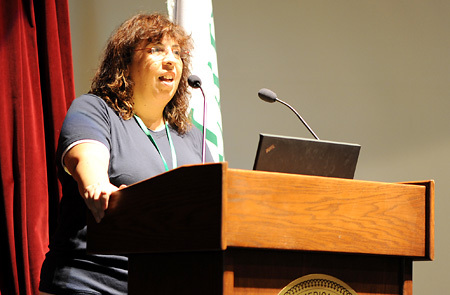 “The objective [of the conference] is to understand what assessment is in order to monitor and improve student learning,” said Dr. Rima Bahous, associate professor in LAU’s Department of Education, who is the director of the university’s Center for Program and Learning Assessment that organized the conference. In addition to Lebanon, there were participants from Jordan, Morocco, Saudi Arabia and Qatar. Mohammad Fraiwan, an assistant professor in the Department of Computer Engineering at the Jordan University of Science and Technology, came to Lebanon with two colleagues to give a presentation during the conference on the establishment of an assessment plan for his department’s undergraduate program. Like most of the participants, Fraiwan said he was there to learn from others as much as he was to share his knowledge and experiences. Besides the two regional conferences, CPLA, which is funded by the Ford Foundation, has also organized three regional workshops since its establishment in 2008.